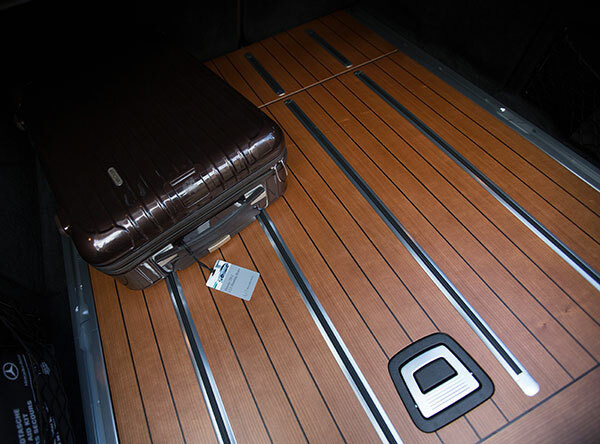 There has been an interesting trend recently of high end luxury cars taking more design/materials queues from yachting… particularly the wooden flooring going into trunk spaces! Remember the Rolls Royce Drophead Phantom Coupé where the paneling opens to showcase a fridge? 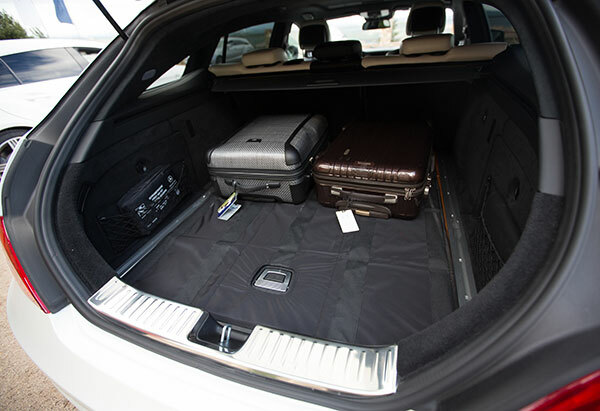 And there is the 2012 Range Rover Autobiography Ultimate Edition. 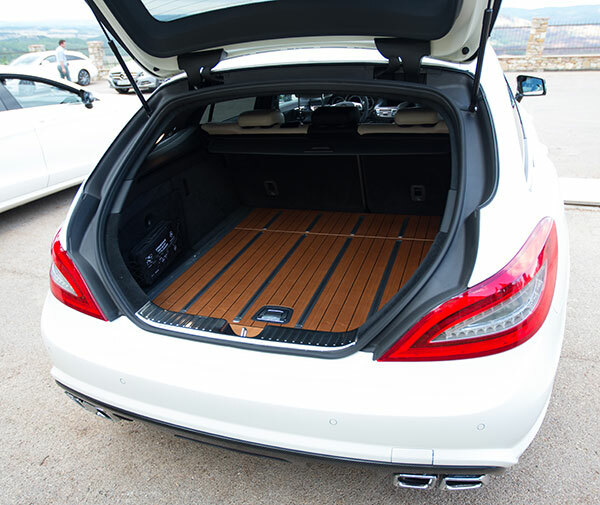 While those two have teak flooring ~ Mercedes-Benz took it to another level with their CLS Shooting Brake with their American Cherry tree wood with inlaid smoked oak and aluminum rails. These “specially selected veneer sheets are glued and pressed by hand in five layers to attain a high level of dimensional stability. 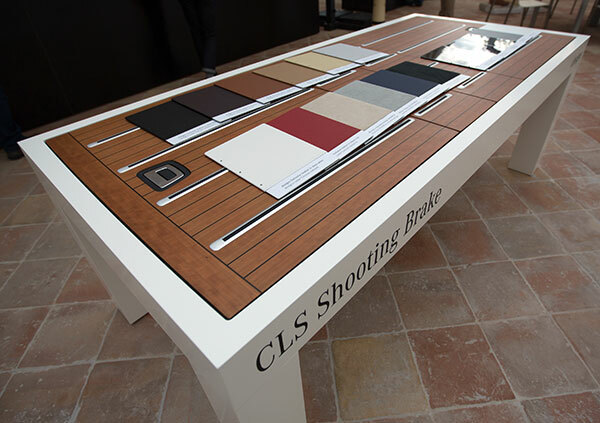 The blanks are milled to their exact format using a CNC machine and the surfaces are ground smooth and impregnated to bring out the wood’s natural beauty,” says the press release. 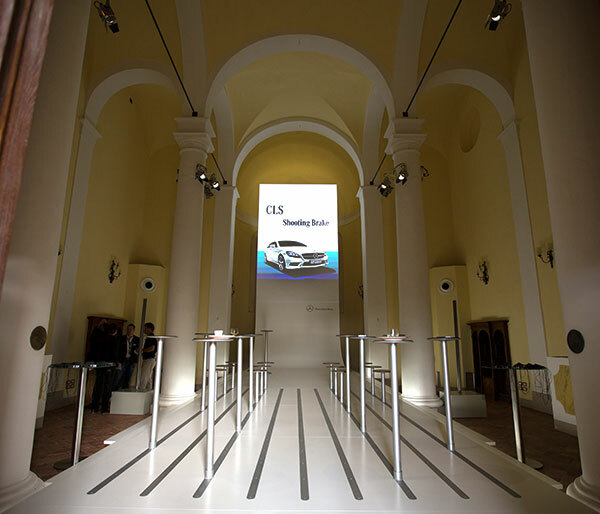 It was most certainly, the stand out design detail of the new Mercedes-Benz CLS Shooting Brake when we were playing with it in Florence ~ and it was fun to see how they used this feature to inspire the design of the press conference in the Castello di Casole’s converted little chapel… from the swooping curves of the seating to projection area… to the metal modular rails that the wood slatted stools and tables locked into… and even the table they displayed the various paint/leather color options of the cars! Take a peen on the next page to see all the fun wooden details of the car and press conference as well as a few other cute details (the tweeters are quite a surprise!) on the next page! 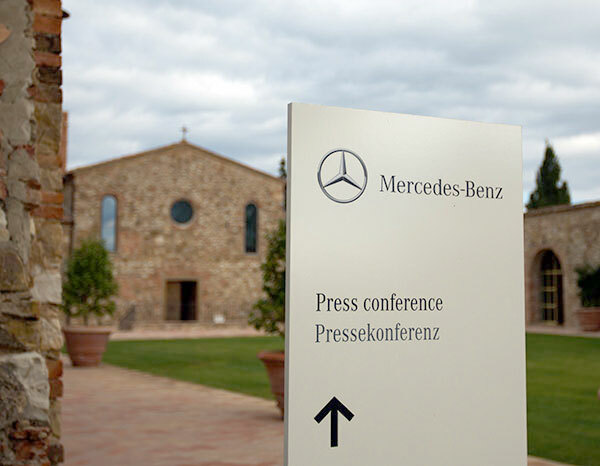 The press conference is in the little chapel right behind! Out in the lunch area, there were faux trunk pieces lining the table, even the handles actually popped up! 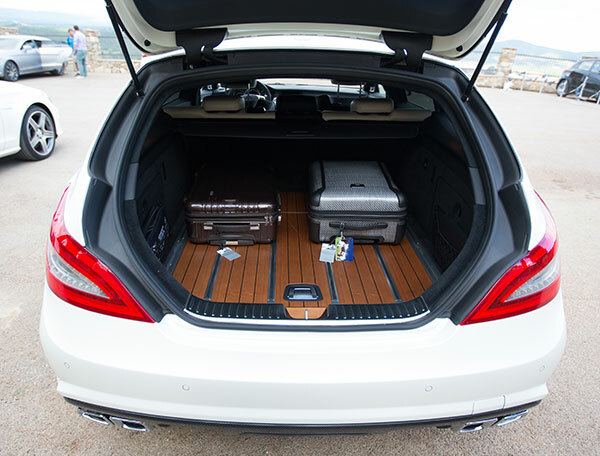 … and now into the actual trunk! 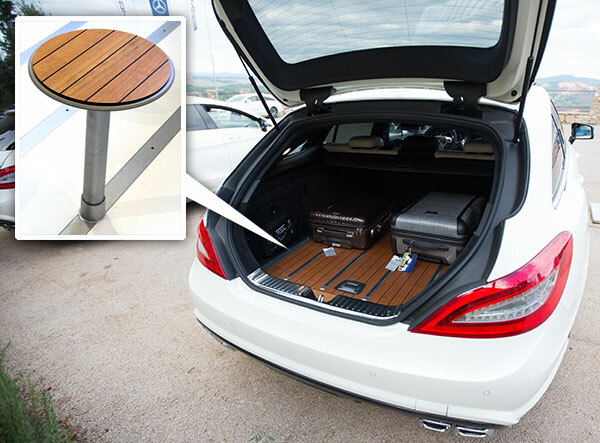 I suppose it makes sense that since Shooting Brakes were originally designed as hunting cars, it is no surprise that the trunk is beyond spacious - and this is with the back row of seats still up! You can even lift the handle to expose even MORE space below! While we weren’t sure just how ruggedly you can treat the beautiful cherry wood, there is also a non slip mat (complete with handle hole!) to protect it as well. 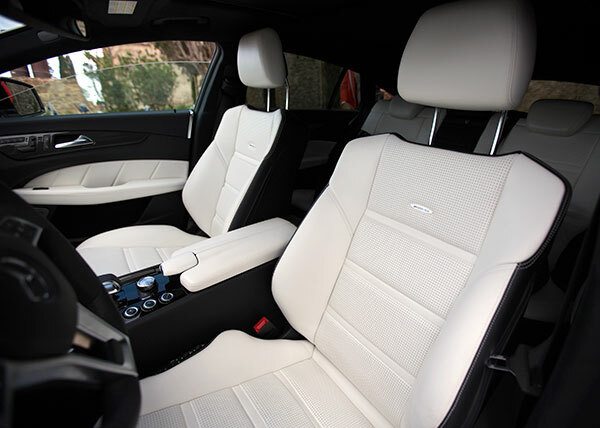 … here’s the black and white interior of the designo magno matte white one we were in! And look at these Bang & Olufsen tweeters?!?! 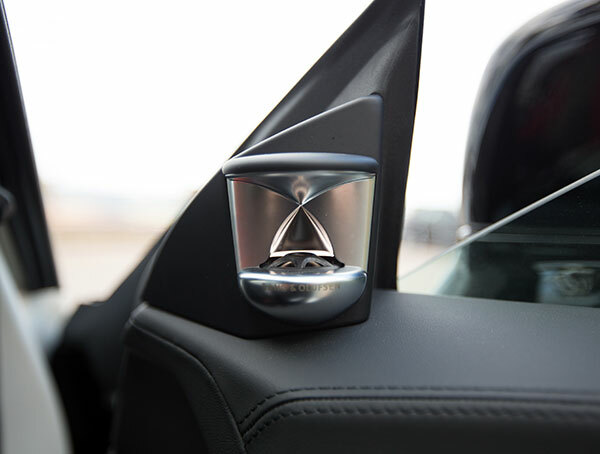 They were quite a surprise when i hopped in the car… they are attached to the door and sit perfectly in the tiny space between door and dash when driving… illuminated from within you have a funky hourglass reflection glowing constantly! 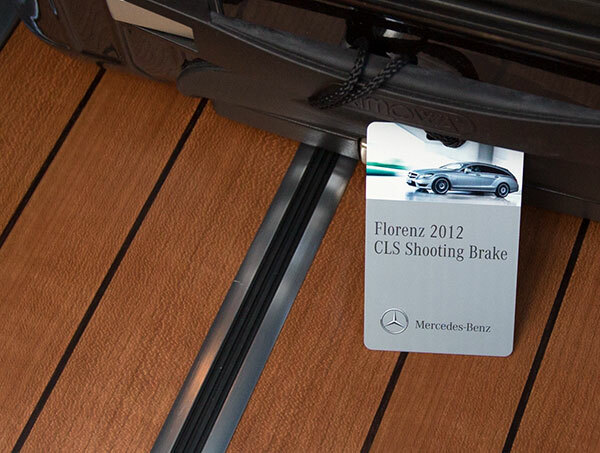 The Mercedes-Benz CLS Shooting Brake will be available in Europe later this fall, with no promises of it coming to the US quite yet… but it is definitely an elegant update to the usual station wagon like styling of cars of this genre! great looking! 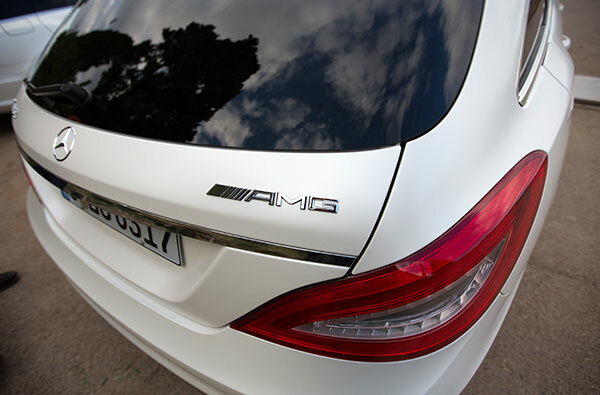 wish they’d make it available in the US, though I guess we haven’t really demonstrated an appetite for wagons. 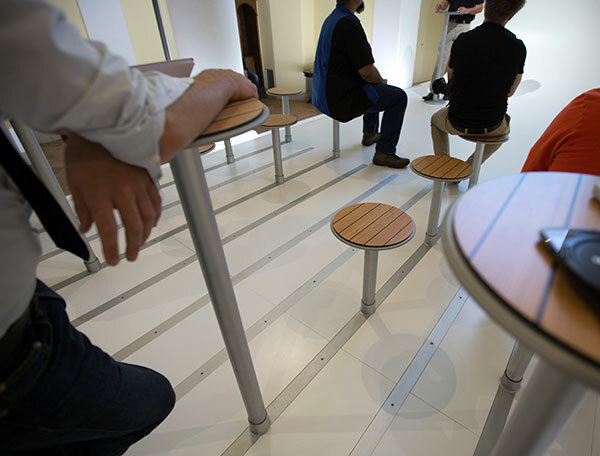 too bad, as they’re such a great blend of form and function when done right. Nice beautiful car concept. I love the chair.